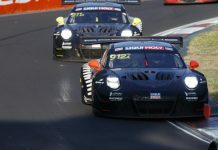 German squad Phoenix Racing will start this weekend’s Liqui-Moly Bathurst 12 Hour from pole position after a record-breaking qualifying run by Laurens Vanthoor at New South Wales’ Mount Panorama circuit. 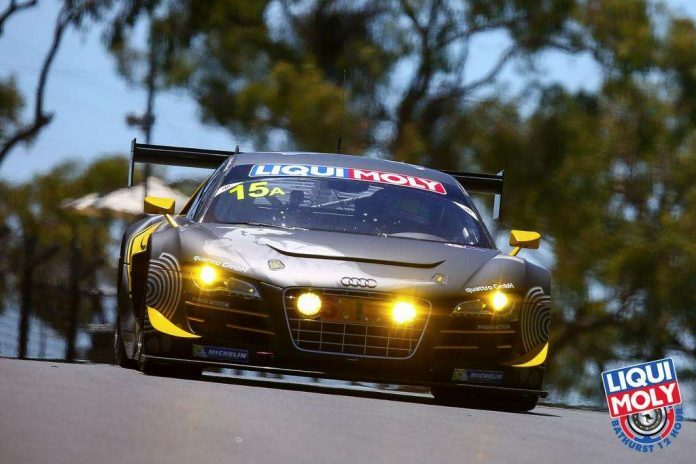 In the dying moments of Qualifying 2, Laurens Vanthoor set the track alight today as the reigning Blancpain Endurance Series Champion became the fastest man around Bathurst, setting an impressive 2:02.552 lap time in his #15 Audi R8 LMS Ultra putting him and his co-drivers Marco Mapelli and Markus Winkelhock at the front of the grid for Sunday’s race. Vanthoor’s ballistic lap knocked David Russell in he #32 Lamborghini Gallardo of JBS Australia from provisional pole. 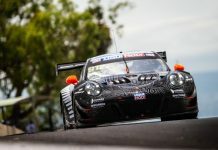 The Australian had held provisional pole for the majority of the 20-minute session, but lost out to Vanthoor with just under four minutes remaining. 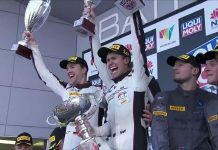 The Belgian’s flying lap also earned him the prestigious Alan Simonsen Pole Trophy, or ‘The Al’ as it is fast becoming known. The session had its fair share of incidents with Japanese driver Katsumasa Chiyo spinning his Nissan GT-R into the wall midway through managed to limp the car back to the pits averting a red flag. However, just moments later the session was halted when the #7 VodkaO Mercedes-Benz SLS AMG GT3 hit the wall at the Cutting and the #27 TFM Ferrari Motorsport NZ Ferrari 458 Italia GT3 stopped on track. Michele Rugolo piloted the #4 AF Corse Ferrari to fourth, while the #97 Craft-Bamboo Racing Aston Martin V12 Vantage GT3 of Stefan Muecke completed the top-five. The full consolidated qualifying results are available on the Bathurst 12 Hour website.